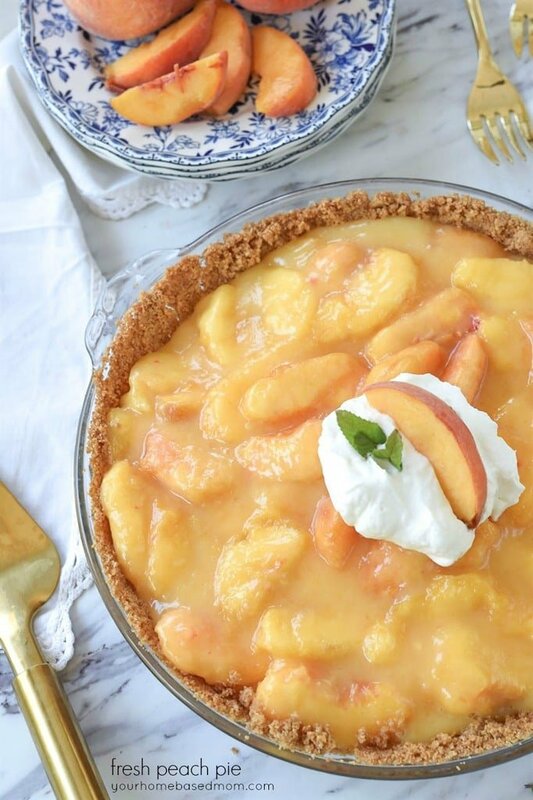 Nothing says summer like a Fresh Peach Pie. It is the perfect way to enjoy those delicious fresh peaches you can pick up at the farmer’s market or pick yourself at the local u-pick farm. The other day my door bell rang and three of my cute little neighbors were standing there with a large box full of peaches! I think I might have actually squealed in delight when I saw them. They had gone with their mother and brother and picked the peaches just that morning, a total of 68 lbs. of peaches. Lucky for me they were sharing. I knew my husband would be excited too as fresh peaches are a favorite of his. We’ve been buying peaches at the local farmer’s market the past few weeks but I hadn’t manage to make anything out of them as they were eaten before I could. I posted a picture of the peaches in my Instagram Stories and asked what I should do with all of them and I got some great responses. 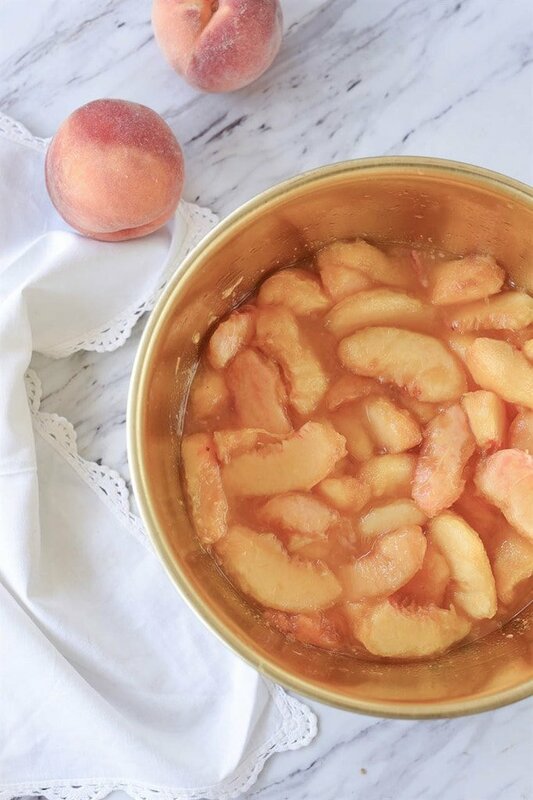 Everything from peach cobbler (the most popular) to peach syrup, to peaches on top of Baked Oatmeal. They all sounded delicious. I wanted to make a fresh peach pie vs. a cooked pie. 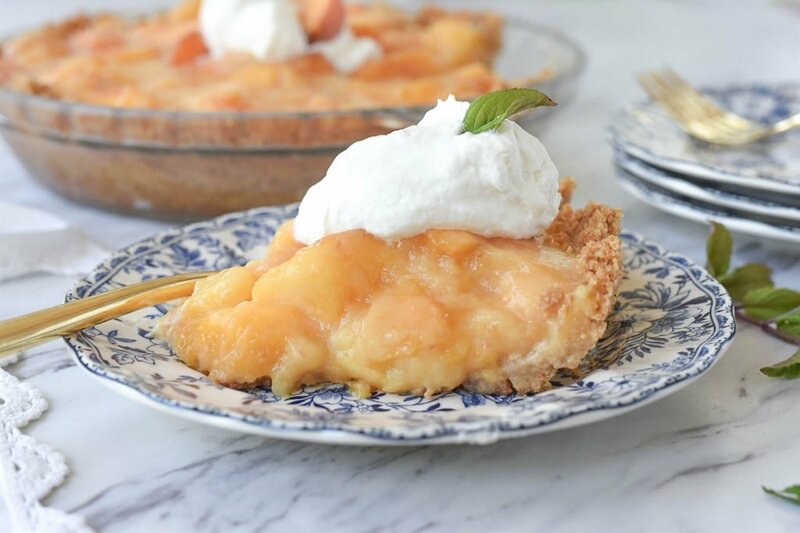 My texture issues definitely prefer a firmer rather than mushier peach and since the fresh peach pie is no bake I knew it would give me a firmer peach and be perfect for the warmer weather. Today’s fresh peach pie recipe comes from my neighbor’s mother in law, Fern. Fern’s recipe calls for a pastry pie crust but I wasn’t in the pastry crust making mood so I decided that a graham cracker crust would be a good solution. A gingersnap pie crust would also be yummy or maybe even a combo of graham cracker and gingersnap. 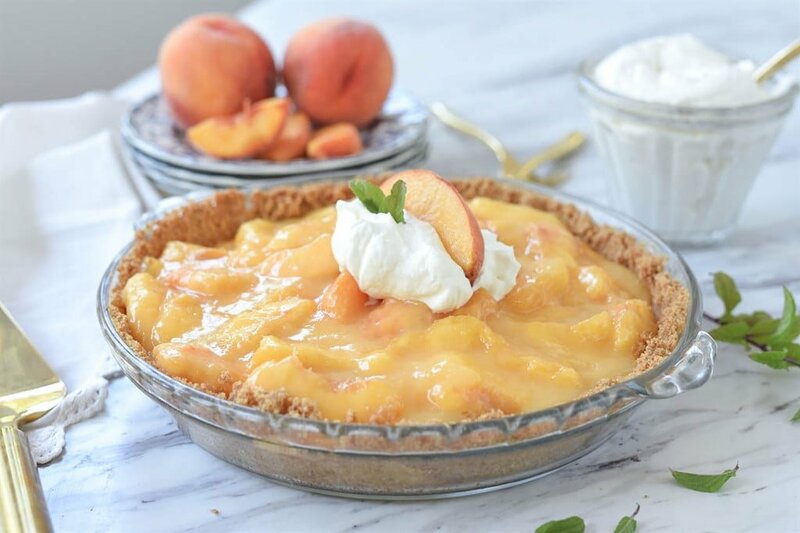 Because there is no baking of the peaches (just the crust) it is a quick and easy pie to put together. I skinned the peaches and then sliced them up. 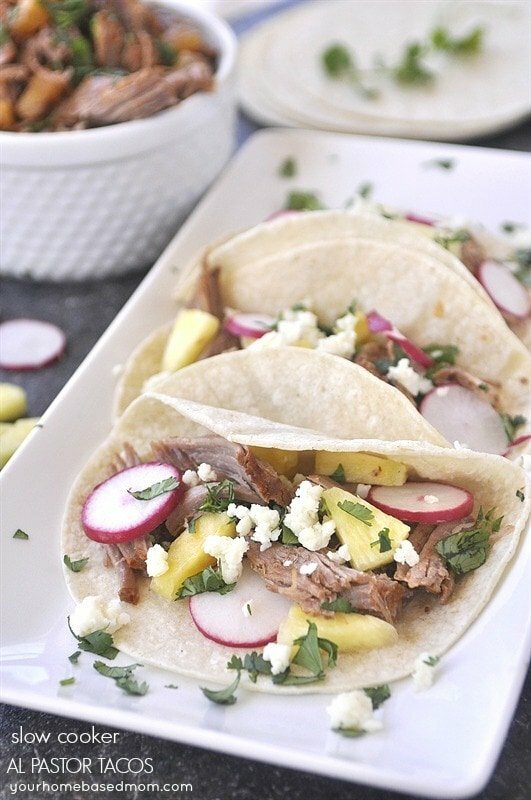 Sprinkled them with some sugar and lemon juice and then let them sit for about an hour to give off some juices. You will need a cup of juice. If your peaches don’t give you that much juice, use orange juice to make up the rest of the liquid. I got about 1/2 a cup of peach juice from mine. The juices are cooked and thickened with some cornstarch and then poured over the fresh sliced peaches. Pour into the prepared graham cracker crust and then allow it to set up in the refrigerator. 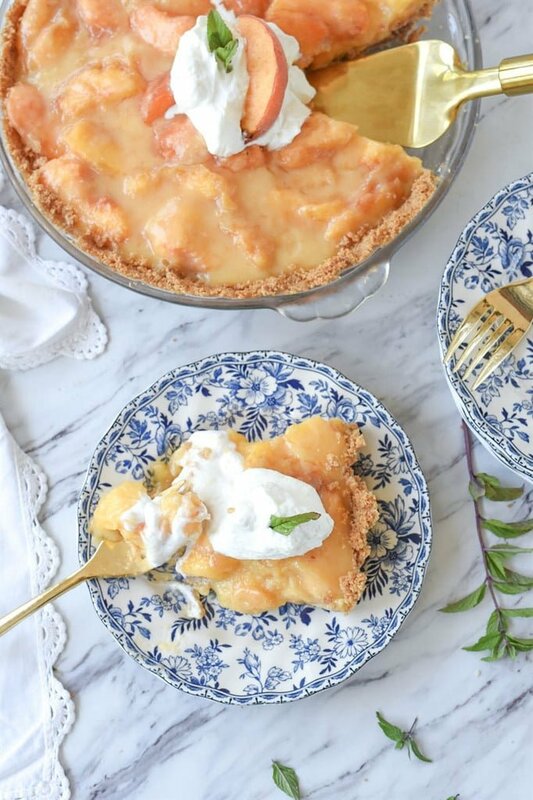 A dollop of whipped cream is the perfect finishing touch to this fresh peach pie. I still have quite a few peaches so I think a peach cobbler is next on the list, or maybe a peach crisp?? 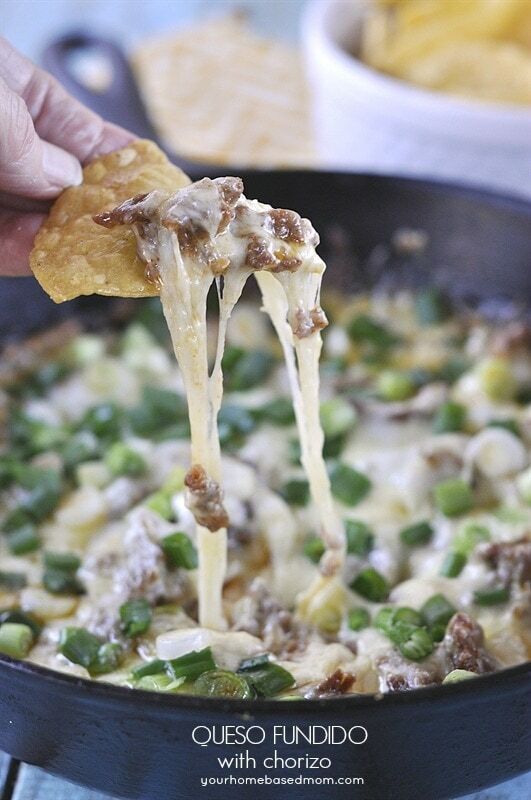 Fill a large pan with water and bring to a boil. Fill a large bowl with cold water. Once water has come to a boil, add peaches to boiling water a couple at a time and leave in water for a minute or so. Remove and put into cold water. The skin should peel right off. If it doesn’t leave in the boiling water for a little longer. Then just cut the peach in half, remove the stone and slice! Did you know I wrote a cookbook? 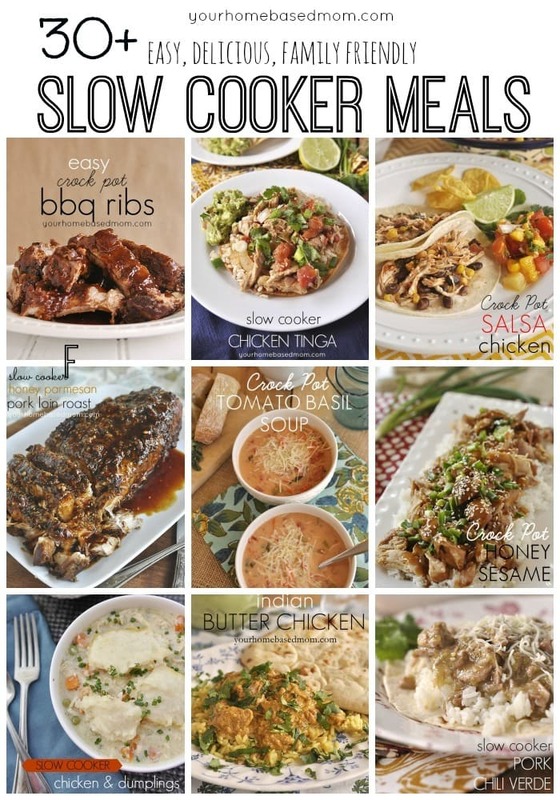 Check out the Holiday Slow Cooker Cookbook for 100 delicious recipes. Nothing says summer like a Fresh Peach Pie. It is the perfect way to enjoy those delicious fresh peaches you can pick up at the farmer's market or pick yourself at the local u-pick farm. 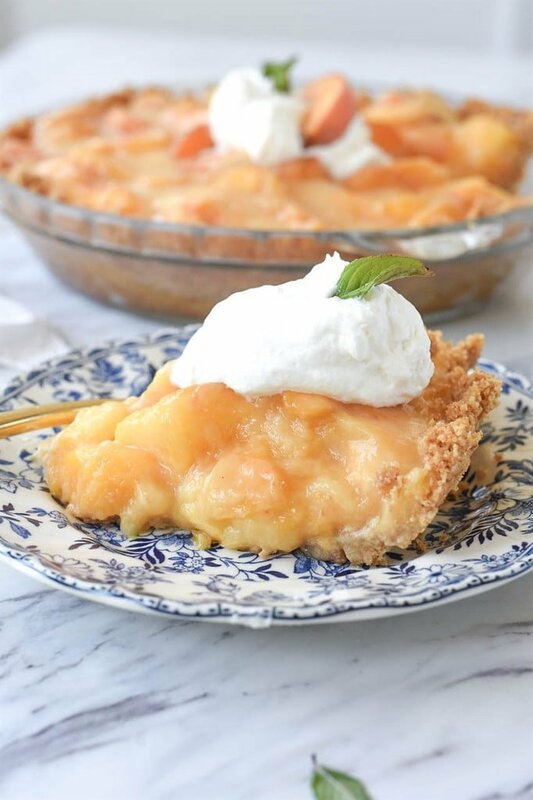 vanilla wafers would also make a good pie crust..Peach jam is excellent too and you can make it freezer jam which is so easy..
OH my heavens this looks divine!! The pie looks delicious. I have never heard of a fresh peach pie. Oh my gosh, that really does sound delicious! 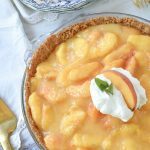 I have not seen a peach pie recipe like that before! So interesting. I’ll have to give it a try! Such a delicious looking pie! Yumm! 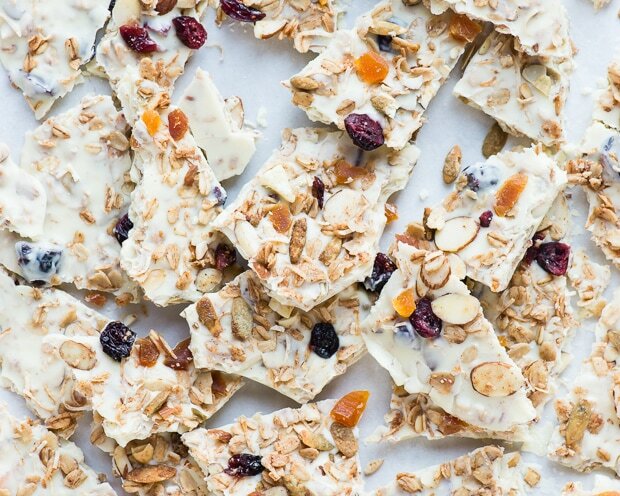 One of the best recipes I have ever tried. 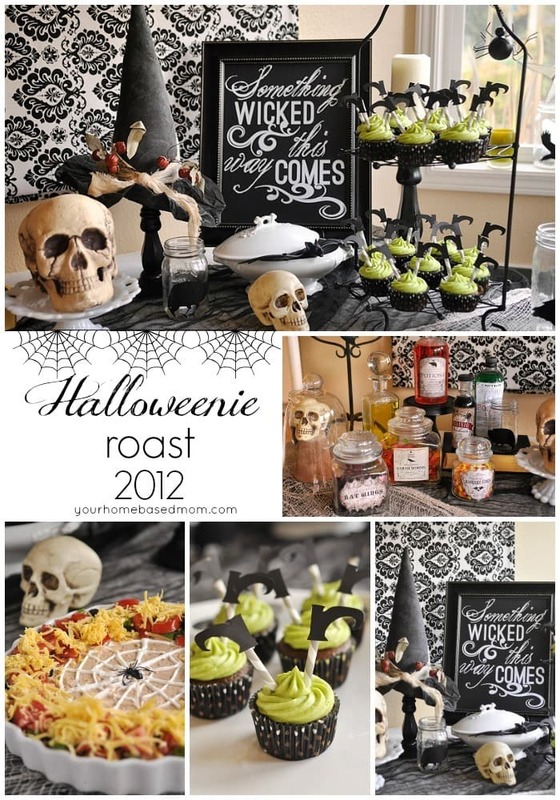 Thank you so much for sharing this with us as I am gonna try making this once again this weekend. Kudos!